The play got its name from North Miami High School, the former stomping grounds of current Grace star Greg Miller. The ball was supposed to be brought to side off the in-bounds, it was. A screen was supposed to be set for Miller, and it was. Off of the screen Miller was supposed to take a pass inside for a basket, but the defense did not allow for that to happen. With just seconds to play in a tie game and the designed play not unfolding the way it was supposed to, Grace sophomore guard Logan Irwin took matters into his own hands and buried a three with 1.6 seconds to play. 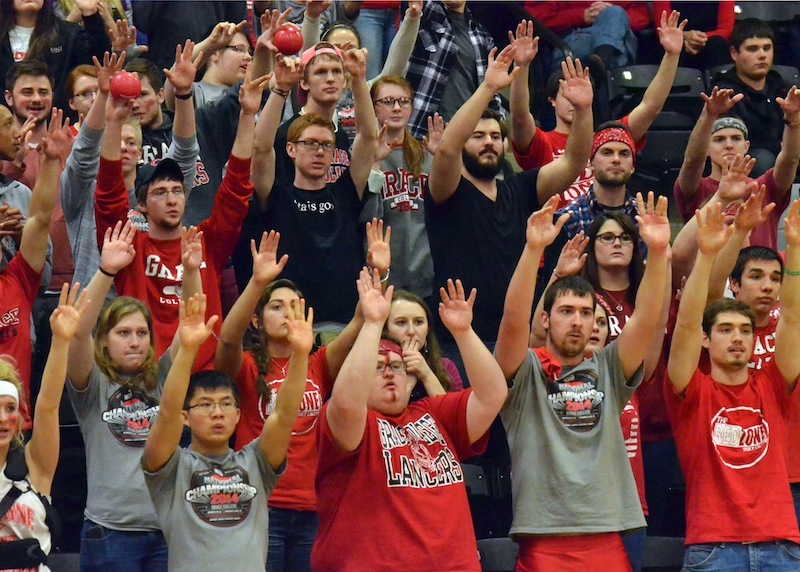 The shot would prove to be the game winner and send the Grace men’s basketball team past Roberts Wesleyan 65-62 in the semifinals of the NCCAA tournament on Thursday night at the Manahan Orthopaedic Capital Center. A game that was anything but entertaining in the first half gave Lancer fans a finish that will be remembered for years to come. Grace came out attacking, never losing the lead in the first half. Everything that could go right for the Lancers was going right. Every player was stepping up, seemingly every break went in favor of Grace. At one point in the first half Grace junior Niko Read went on a hot streak hitting three three-pointers to give the Lancers all the momentum in the world. With a crowd full of rowdy Grace students behind them and a 39-25 lead at the half, the Lancers looked to be unstoppable. That incredible energy and momentum was somehow lost during the break as Grace slowly watched Wesleyan chip away at the lead little by little for the entirety of the second half. All the breaks that the Lancers were getting earlier were suddenly going the other way, the once unstoppable team suddenly looked very vulnerable on its home court. “We stopped attacking,” said Grace head coach Jim Kessler. “For us to be successful we have to attack. That’s how our offense works. We stopped attacking and they (Roberts Wesleyan) got back into the game. Logan Irwin was Thursday’s hero as he hit the game winning shot to lift the Lancers over Roberts Wesleyan. The Whitko alum finished with a game high 18 points. No. 55 for the Redhawks was Kevin Madiamba who made himself a physical force inside in the second half. Madiamba scored nine points after the break to finish with 11. He also had five boards and a block. Madiamba helped get his team back into the game and bring the Grace crowd to a silence as the Redhawks took their first lead of the game, 61-60 with just 1:31 to play. Grace quickly recovered to up 62-61 and then found itself tied at 62 after a Wesleyan free throw. A pair of missed free throws from Irwin with under a minute to play gave the Redhawks the ball with a chance to tie but Grace’s defense stopped the threat to set up Irwin’s go-ahead shot off the broken “Miami” call. Irwin was the game’s leading scorer with 18 points and was one of four Lancers to finish with double-digits. Read (12), Miller (10) and Jared Treadway (14) were the other three. Wesleyan had three scorers with double-digits and was led by Tyrel Dixon’s 14 points. The shot from Irwin was clutch, exhilarating but most of all it was the catalyst for Grace to get to Saturday night’s championship game against Point Loma. Grace has never won an NCCAA title but this will be the fourth time the Lancers have made it to the title game in school history. Making it back to the title game is something Kessler hopes his team can put into perspective. “I don’t think our guys appreciate the level of talent that is in this tournament,” said Kessler. “We haven’t played in it the past few years but these are some good Division I teams. Teams I think would’ve maybe been Elite 8 teams down in Branson last season in our division. Thursday’s with was No. 699 for “Coach K” which makes Saturday’s game all the more intriguing to fans, but not the the coach. Kessler denied the quest for No. 700 being any motivation for him or his team. To show just how little Kessler talks about his career win total, when being asked about the importance of winning a title to coincide with No. 700, a Grace assistant coach chimed in saying that he did not even know about Kessler’s win total until Wednesday night. Perhaps humility is the key to the success of Kessler and his 2014 Lancer squad, which entered the tourney as the No. 7 seed. 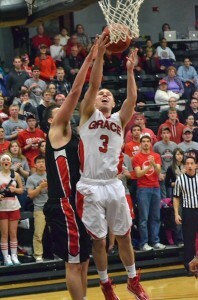 Grace (20-14) will tip against Point Loma (19-11) at the Orthopaedic Capital Center at 5 p.m. on Saturday. Point Loma, the No. 4 seed in the tourney, upset top-seeded Southern Nazarene 68-54 in the first semifinal Thursday night. This story appeared on Stacey Page Online. Photos are by Nick Goralczyk.